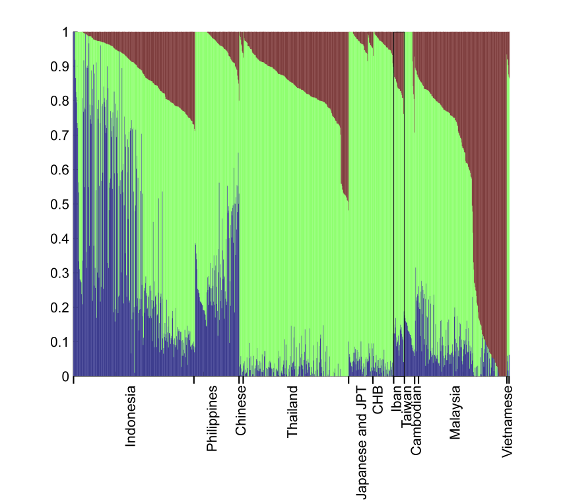 Wan Isa Hatin et al, Population Genetic Structure of Peninsular Malaysia Malay Sub-Ethnic Groups. PLoS ONE, 2011. Open access. The authors go to some quite incredible speculations to explain the various clusterings of Malays (Melayu, boxed populations in graph), notably imaginary massive admixture with Indians and Chinese. 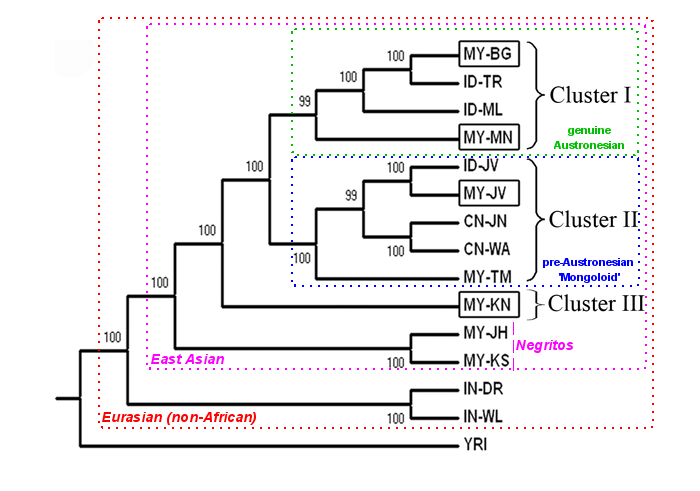 Cluster I represents more or less genuine Austronesians by blood. I say this because the Thoraja (ID-TR) have in the past been shown to be quite archetypal Austronesians in autosomal studies. Cluster II represents more or less genuine pre-Austronesians, proto-Malay or whatever you wish to call them. They cluster well with “Chinese”… from Yunnan (SE Asian Tibeto-Burman and Mon-Khmer speaking peoples), which are the only “Chinese” in this paper. Yunnanese, Proto-Malay, Melayu Jawa and Javanese Indonesians cluster too tightly to be any admixture: they are one single stock. The so called cluster III is no cluster (it needs at least two elements to be called that way) but an isolate. It may indicate an even older stock than proto-Malay but it may also indicate admixture with either Indians or Negritos. There is also a 3D PC analysis but, besides showing that the same dual clustering among SE Asian Mongoloids, it is very difficult to read. I’d say that it is suggestive of both Melayu Minang and Melayu Kelantan showing a slight tendency towards Indians along dimension 3 rather than towards Negritos but it may well be an optical illusion. It does place these two populations somewhat apart within the region anyhow.